Rocketry Works offers almost any size mylar streamer you might want. These reflective 2 mil thin plastic streamers are a great way to safely recover lightweight models and reduce the risk that your model will drift beyond your flying field. Rocketry Works' standard streamer for small rockets (up to 40 grams or 1.4 oz) is 2 inches wide by 24 inches long, but we also offer custom cut streamers to meet your needs for heavier rockets. As an extreme example, the orange G Streamer Duration competition model shown above used a 2 ft by 20 ft folded mylar streamer inside a 29mm diameter airframe tube. The streamer kept the model aloft for more than 90 seconds on its way down from its 5,000 ft apogee on a G powered competition flight. Most streamers are a lot smaller, but when used right, they can be a great way to land your lightweight rocket safely without drifting too far from your launch pad. Basic use of a streamer is very simple; you can just tape the streamer to your shock cord using any of several kinds of tape: scotch tape, masking tape, electrical tape, or strapping tape. Any will work, but the main issue is to make sure that all the sticky bits are stuck to the streamer, so you don't run into tangles. The best way to do that is to lay your shock cord (in this case, a piece of lightweight Kevlar shock cord) across the streamer, about an inch from the end of the streamer. Then just tape the shock cord to the streamer along the length of the shock cord using a piece of tape that is shorter than the streamer is wide. That seems simple enough, and it is. A slightly more advanced move is to increase the drag your streamer can deliver on the way down. When you increase the drag, you will slow the rocket down more and help ensure a safe landing that will not damage your rocket. The easiest way to increase drag on a streamer is to fold it into accordion folds for most of the streamer. Starting at the loose end of the streamer, start with a 1/2 inch fold perpendicular to the long axis of the streamer. Make the fold a neat one, with as little overlap as possible. That's sometimes hard for elementary school children, so they may need an adult's help. After the first fold, fold the streamer again in the opposite direction repeatedly, making a series of Z folds up to the last 3 or 4 inches of the streamer. Try to keep all the folds parallel and the same width, so the folded portion of the streamer stacks neatly on itself. You'll certainly have some irregularities, and that's fine, but try to correct any inconsistencies. Once you have the folded portion stacked in a neat 'book,' use the side of a pencil or pen or ruler to crease the folds very well. You want them to stay folded when they unfurl, so you have as much of a 3 dimensional cross section as possible. The wind will whip the streamer all around on the way down, but the folds will slow the streamer by as much as double compared to an unfolded streamer. To pack your streamer into the rocket for flight, start by neatly re-folding the streamer, starting from the loose end. It will fold easily on the creases. If necessary, you can bend the folded section slightly to fit into the airframe tube. Then you can wrap the unfolded portion of the streamer around the folded section, which will leave you with a smooth cylinder of mylar with a shock cord running through it. Insert Recovery Wadding or Dog Barf loosely into the airframe tube, and then slide your streamer roll into the tube. finish by putting the nose cone in position, and you're ready to load your motor and fly! In this photo, a 3x36 inch folded and rolled streamer easily fits inside an 18mm (BT-20) airframe tube. You may be left wondering how to tell how big a streamer you need. The best way to predict what size streamer you'll need is to use a modeling software like OpenRocket to simulate your rocket and flight conditions. This will allow you to vary the size of your recovery device to determine the best fit for your needs. A safe descent rate is below 20 ft/second, and on hard surfaces like desert soil or pavement, 10 ft/second is much better. But slower descent rates mean more drift, so you need to use your judgement to strike a balance. 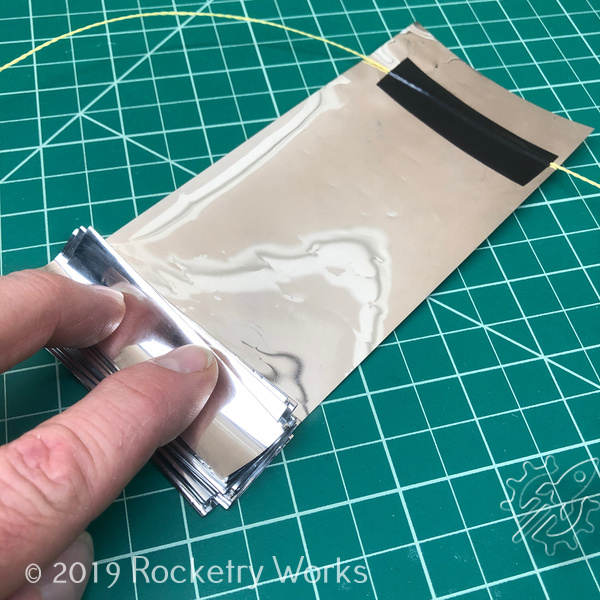 As a point of reference, Rocketry Works' standard streamer for small rockets (up to 40 grams or 1.4 oz) is 2 inches wide by 24 inches long, and only does the job at 40 grams when folded as described in this article.